I think that the people of the Pacific Northwest, for the most part, are really enjoying the rain that we have finally been getting. I love sitting outside and just smelling in the scents and listening to the rain fall. When I went out on a misty, sprinkling Sunday hike, I kept my eyes to the ground in search of mushrooms. 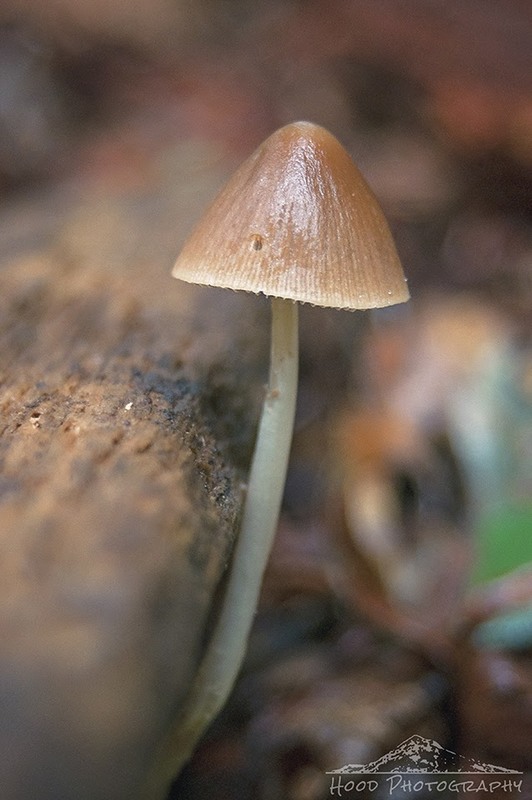 I was surprised to only see this one spindly, lone mycena growing out from under a log the entire day. But even seeing just the one fungi made me smile, because I love September, with it's beginning signs of autumn. I am sure today when the weather warms up again and the rain takes another break, more will appear. Suppose the mushrooms are reliable. Great capture of this little guy. Mushrooms are starting to pop up here, as well. This weather is wonderful... We PNWners love our rain! Very nice shot - love the colors....I'm a real fan of neutral shades, and this is just beautiful! We see them here starting in late August. Ahhh thanks for being the first to link up with LTTL after my long break. That totally made my day. And, I love this mushroom shot.